(Steven Senne | The Associated Press) In this Thursday, July 12, 2018 file photo, a newly-transplanted cannabis cuttings grow in pots at a medical marijuana cultivation facility in Massachusetts. In a report released on Monday, Aug. 27, 2018, researchers at UC San Diego detected marijuana's mind-altering ingredients in breast milk of nursing mothers, raising doctors' concerns amid evidence that increasing numbers of U.S. women are using pot during pregnancy and afterward. 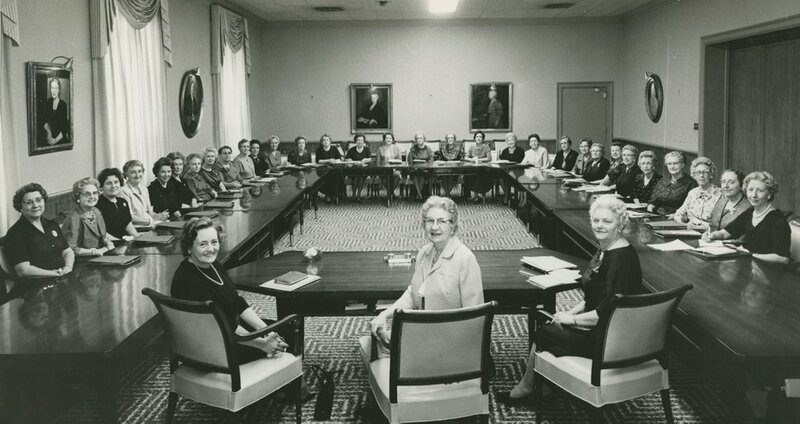 (Courtesy photo | The Church of Jesus Christ of Latter-day Saints) Belle S. Spafford with Relief Society General Board. Colleen McDannell has taught religious studies at the University of Utah for nearly three decades. She has written books about heaven, Catholic reforms and Christianity’s place in popular culture. The book punctures the stereotypes attached to Latter-day Saint women and reveals them as, at times, outspoken and progressive and, at other times, as insular and conflicted. (Photo courtesy of The Church of Jesus Christ of Latter-day Saints) Marty Stephens, a lobbyist and director of community and government relations for The Church of Jesus Christ of Latter-day Saints. As voter support for Utah’s Proposition 2, legalizing medical cannabis, diminishes, the fear among backers arises: If the ballot measure fails, will the church, an outspoken Prop 2 opponent, still push for medical marijuana legislation, as it has promised, before the Utah Legislature? 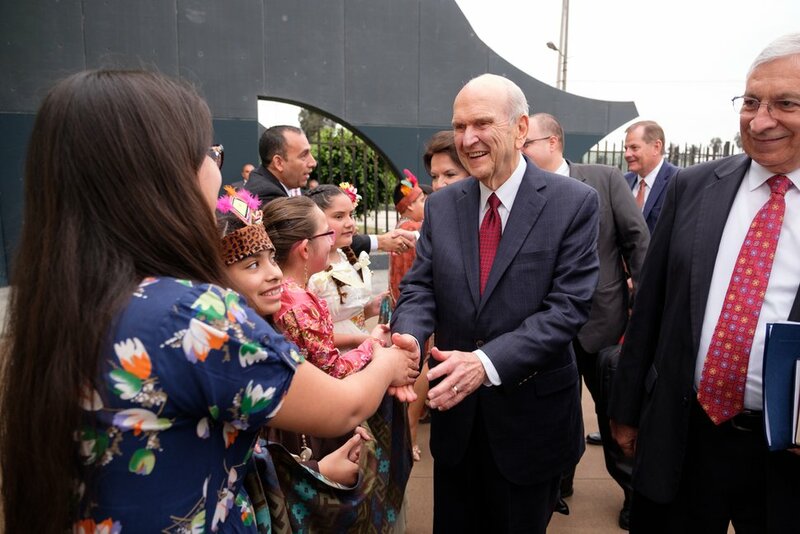 (Courtesy photo | The Church of Jesus Christ of Latter-day Saints) Young Latter-day Saints in traditional costume in Peru greet President Russell M. Nelson before he speaks at a devotional Oct. 20, 2018. • Met with Peru’s reformist president, Martín Vizcarra, about the church’s humanitarian efforts to lift the poor. “He was very warm and gracious,” Nelson said in a news release of his host. • Huddled in Lima with Latter-day Saint missionaries and held a devotional with thousands of Peruvian members. • Visited a potential temple site in north Lima. It will be the city’s second temple and Peru’s fourth. The next stops for the 94-year-old leader and his wife, Wendy — along with apostle Gary E. Stevenson and his wife, Lesa — will be in Uruguay and Chile, where the new Concepción temple will be dedicated on Sunday. Earlier in the year, Nelson undertook a global tour that flew him to eight cities and several continents in 11 days. Since taking the church’s reins in January, he also has traveled to Canada (twice) along with Puerto Rico and the Dominican Republic. (Courtesy photo) Tony-winning Broadway star Kristin Chenowith. Talk about a pop-u-lar featured guest. Kristin Chenoweth, the original Glinda from the smash Broadway hit “Wicked,” will sing at a Dec. 13-15 Christmas concert with The Tabernacle Choir at Temple Square at the Conference Center in downtown Salt Lake City. "Kristin Chenoweth is larger than life; I just hope the Conference Center can contain her performance,” choir President Ron Jarrett said in a news release. “We have a very special concert planned to showcase her tour de force talents, which will ring in the Christmas spirit in an unforgettable way." The Tony-winning Chenoweth is an activist for the LGBTQ community. In 2017, she was honored by the Trevor Project — which focuses on youth suicide prevention — with its Icon Award. When the $3.6 billion rebuild of the Salt Lake City International Airport takes off in two years, families of Latter-day Saint missionaries will have a special place to land to greet their returning loved ones. The new terminal will include a meet-and-greet reception area where larger crowds can welcome home, say, missionaries and military members. Church spokesman Daniel Woodruff told the paper that some 30,000 Latter-day Saints travel through the airport every year on church business alone. Right now, the airport reunions for missionaries can become so vast, so elaborate, so loud (banners, balloons, cowbells, even professional camera crews) that they pose problems for other travelers. 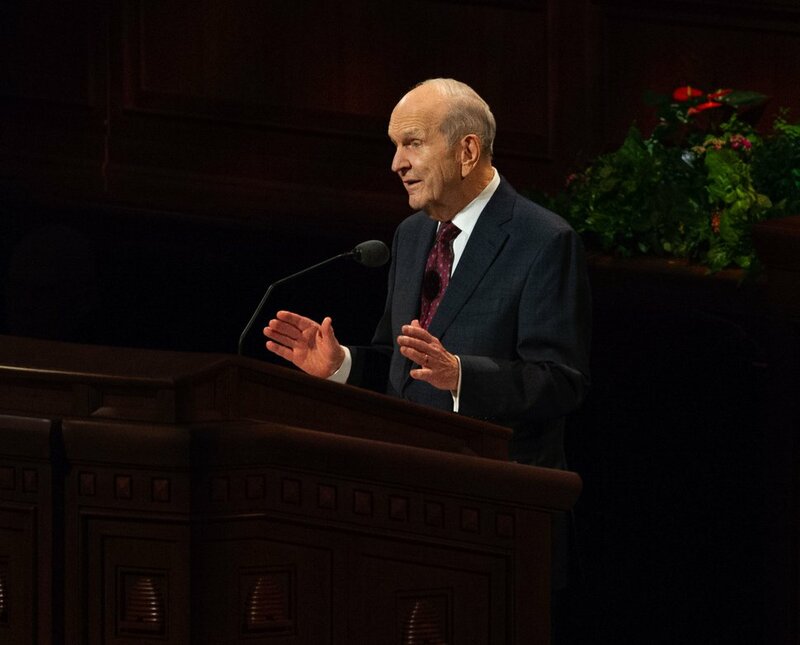 (Keith Johnson | Special to The Tribune) President Russell M. Nelson speaks during the concluding session of the 188th Semiannual General Conference of The Church of Jesus Christ of Latter-day Saints on Oct. 7, 2018, in Salt Lake City. Latter-day Saints are free to believe that their prophets are fallible, maintains By Common Consent guest blogger T.L Peterson, because President Russell M. Nelson himself forcefully preached in General Conference that his predecessors were wrong to embrace the “Mormon” nickname. And that’s a good thing, the blogger adds. Peterson points, for instance, to “lingering” notions that give rise to racism within the church — even after the end to the ban on black men and boys bearing the priesthood and on women and girls entering temples. Brittney Hartley, in a guest post for Exponent II, sees a flip side to Nelson’s push to use the full name of the church — and the outcry against it from some quarters. (Courtesy photo | The Church of Jesus Christ of Latter-day Saints) A North Carolina resident tells President Dallin H. Oaks about his experience of living through Hurricane Florence. “There arose a great storm,” the Gospel of Mark records. Two storms, in fact, if the New Testament writer were recording recent events in the Southeast, slammed by Hurricanes Florence and Michael. 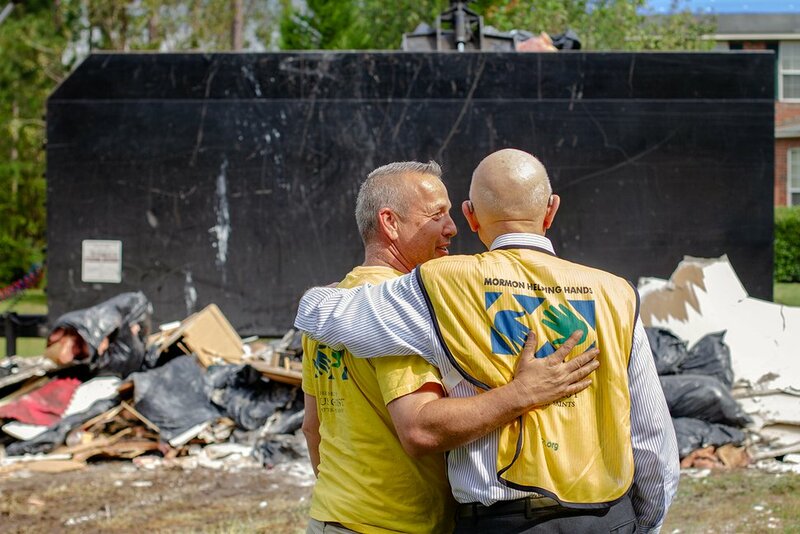 In the wake of those tempests, a church delegation headed by Dallin H. Oaks, first counselor in the governing First Presidency, visited North Carolina, South Carolina and Florida to comfort the victims and buoy up their hopes. Joining Oaks and his wife, Kristen, were fellow apostle David A. Bednar and his wife, Susan, and Jean B. Bingham, general president of the women’s Relief Society, and her husband, Bruce. Florida Gov. Rick Scott stopped by the meeting to thank church members for their help with the cleanup, according to a church news release. (AP Photo/Rick Bowmer) The Book of Mormon is shown Tuesday, Aug. 21, 2018, Salt Lake City. Sheraton, Westin and other Starwood hotels are finding their religion. Marriott International, which bought Starwood two years ago, has begun putting copies of the Bible and the Book of Mormon in Sheratons, Westins and other hotels in the Starwood family. At the same time Marriott brand hotels are adding copies of the Bible and the Book of Mormon to some 300,000 guest rooms in newly acquired locations, inns affiliated with publicly funded organizations like universities are giving religious texts the heave-ho. Dixie State University recently removed these scriptures from the rooms at the state-owned school’s inn after a complaint from the Freedom From Religion Foundation. Utah State University beat the latest church-state criticism to the punch. The Logan school’s University Inn took religious volumes out of its guest rooms at least a year ago, The Herald Journal reports. Instead, the front desk makes donated religious texts available upon request. The University of Utah’s Guest House Hotel says it never has had copies of the Bible and the Book of Mormon in its guest rooms. Bibles, often provided by Gideons International, are commonly found in guest rooms of privately owned hotels. Marriott, whose founders are Latter-day Saints, also supply the Book of Mormon, their faith’s foundational scripture. 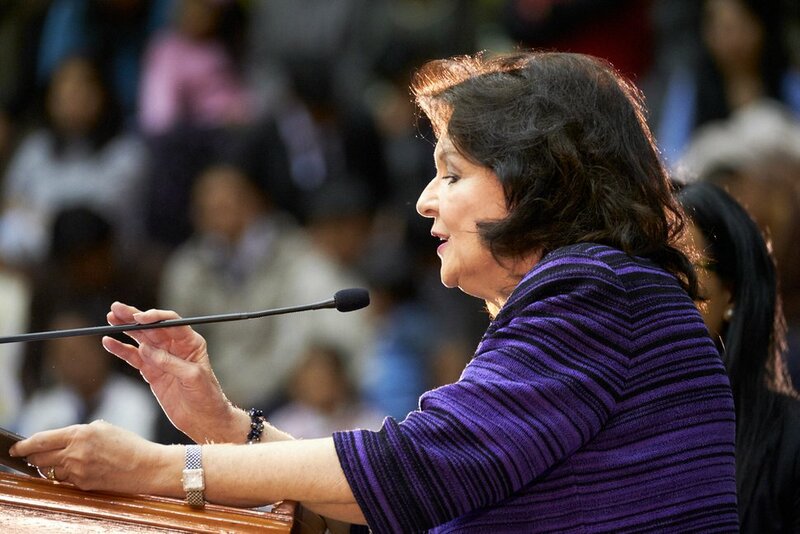 (Courtesy photo | The Church of Jesus Christ of Latter-day Saints) Wendy Nelson, wife of President Russell M. Nelson, speaks to Latter-day Saints in Bolivia during the Oct. 21, 2018, devotional. “It is a spiritually elevating experience to be with you. You have moved us to tears. It is you, the Saints of Bolivia, not the elevation, that take our breath away. It is you, the Saints of Bolivia, that take our spirits higher and higher." — Wendy Nelson, wife of President Russell M. Nelson, speaking to members in El Alto, Bolivia, elevation 13,615 feet.